Take I-95 North to Exit 92, Westerly-Pawcatuck. Take a right on Route 2 toward Route 78. Take a right onto Route 78. 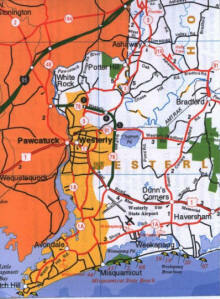 Take I-95 South to Westerly exit, Route 3. 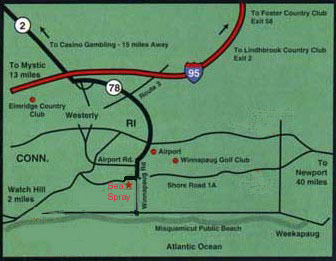 Turn right onto Route 3 toward Route 78. Take a left onto Route 78. Continue on to signal light. Cross Route 1 intersection to Airport Road. At the stop sign, take a left onto Winnapaug Road. Turn right at the traffic light onto Shore Road (1A). The two buildings of the Sea Spray Inn are painted bright yellow and are immediately on the left.